Do I Have to Pay for My Wife's Divorce Lawyer? Divorces can cost a lot of money, and you can easily run up thousands of dollars in legal fees trying to end your marriage. Even worse, you may be ordered to pay your spouse's attorney fees as well. Most states' legislative codes allow the court to order you to do so, but certain criteria apply. Counsel fee orders are rarely punitive – you probably won't have to pay just because you're the one who wants to end the marriage, even if you committed some marital misconduct, such as adultery, that caused your wife to file for divorce. The court can order you to pay your wife's attorney fees out of a sense of fairness. If she doesn't work, has no income of her own and has no separate property she can sell to raise money, most courts will consider it grossly unfair that she should have to proceed without a lawyer because she can't afford one. This is particularly true after a long-term marriage and if you go out and retain the best, highest-priced attorney in town. If you have sufficient income to help her out, the court can order you to do so because you should both have access to the same level of professional help. If you and your wife earn roughly the same incomes, however, it's unlikely you will have to pay her lawyer. If your incomes are disparate, it's possible that the court will order alimony pendente lite shortly after one of you files for divorce. This is a temporary form of alimony in that the payments are made directly from the higher wage earner to the other spouse and last only until the divorce is granted. Technically, alimony pendente lite is intended to allow your wife to fund her own divorce costs during the divorce proceedings. In actuality, she may or may not use the money for a lawyer – it's up to her. If she doesn't, it's unlikely that a court would order you to pay her attorney fees on top of alimony pendente lite, because the alimony order is already meant to meet this purpose. Typically, your wife would have to file a motion with the court, asking for this type of temporary support – it's not automatic. On occasion, one spouse's behavior during divorce proceedings is so disruptive or reprehensible that the court will step in and issue a punitive order for counsel fees. This might be the case if you attempt to stonewall the proceedings. For example, you might not want the divorce and so you try to stop it by not responding to court orders, or you attempt to conceal financial assets that you don't want to share. If your wife is forced to repeatedly seek the court's intervention to convince you to cooperate, a judge can order you to pay the attorney fees she incurred in doing so. If you and your wife have sufficient marital assets, it's possible that the court will order liquidation of some property to pay your counsel fees. This might be the case if neither of you has enough available cash. Such an order typically acts in lieu of having you pay her lawyer. At the end of your divorce, when property is divided, the court takes such an award into consideration. If only your spouse took the funds, the sold asset is attributable to her for purposes of equitable or community property division. She'll effectively be awarded the asset that was sold, even if the money is already spent. Otherwise, it comes off the top of your marital estate and the court divides the remaining property. If your spouse is guilty of some particularly egregious behavior, some states' legislative codes may bar her from an award of counsel fees. Generally, however, her actions must be pretty onerous, such as if she attempted to kill you or she committed some other felony offense in an effort to harm you. Continuing Education of the Bar: In the Divorce Wars, Who Pays the Attorney Fees? Griffith, Young & Lass: Can You Have Your Spouse Pay Your Attorney Fees in a Divorce? DADS Divorce: What is Alimony Pendente Lite? Bird, Beverly. "Do I Have to Pay for My Wife's Divorce Lawyer?" 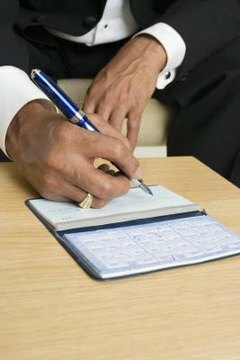 , https://legalbeagle.com/12294781-pay-wifes-divorce-lawyer.html. Accessed 21 April 2019.